The tee is reserved for Ladies' competitions every Tuesday from 10.30-1.00 and 4.30-5.00. In addition ladies' competitions are held on the first Saturday of each month. Entry sheets are posted in the Ladies' locker room three weeks in advance. The section organises two opens each year - a pairs competition in May and a TexMex in September. Details are on the 'open' section of the website. There is also a guest day in August. 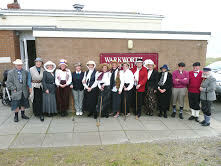 The photo shows a group of ladies dressed in appropriate fashion to celebrate the Club's 125th anniversary in 2016.